Firefighters and explosive experts will tell you that shooting fireworks can be a dangerous activity that only should be done under the supervision of professionals. Emergency room workers will tell you that those experts are correct. There is another way to shoot fireworks and be safe at the same time: Use your digital camera to shoot fireworks photos. Fireworks photography can be an enjoyable hobby for beginning and intermediate photographers that lends itself to amazing images of Fourth of July celebrations or other occasions with fireworks. Here are a dozen fireworks photography tips that can help you shoot some amazing photos during Independence Day celebrations. Read through these fireworks photography tips and stay safe during the Fourth of July. Equipment. Make sure you have everything you need, including extra memory cards, extra batteries, and tripods. Chances are good you'll have to park a vehicle far from where you shoot your fireworks photos, so plan ahead to make sure you have the needed equipment. Also, bring a small flashlight or penlight to help you make changes to the settings on your camera in the dark. Location. One of the best fireworks photography tips -- and one of the most overlooked -- is working ahead of time to determine the best location to shoot fireworks photos. Obviously, you need to find a location that is free of trees, tall buildings, and overhanging wires that could ruin your photo. However, you also should make sure the wind is at your back as you face the fireworks show. Then, the wind will carry any smoke away from you, giving your camera a clear shot of the fireworks. Try to pick a spot well away from other people, thereby avoiding having a stray head or somebody walking in your shot. Location, again. Many large fireworks shows take place near historical buildings or other well-known landmarks. If you can frame your fireworks photos with these landmarks in the background of the shot, you may end up with a more interesting photo. Fill flash. If you want to include some family members in the foreground of your fireworks photos, try firing a fill flash that will illuminate the people near the camera while capturing the fireworks in the background. It can be tricky to time the shutter speed with this technique, so you may want to try several shots at different shutter speeds to find a good shot. Otherwise, make sure the flash is turned off. Go manual. Most fully automatic, point and shoot cameras rarely capture good shots of fireworks. Such cameras simply cannot set the exposure and shutter speed correctly because of the random nature of when the fireworks appear in the sky and because the light from the fireworks is very bright and doesn't last long. Some point and shoot cameras have a fireworks option in the scene modes, which may create a few good photos. However, the most reliable option is to manually control the shutter speed and exposure. With a manual focus camera, be sure to set the focus to infinity. High quality. Make sure you set your camera to the highest-quality settings possible. Use plenty of resolution with fireworks photos. Use low ISO settings. 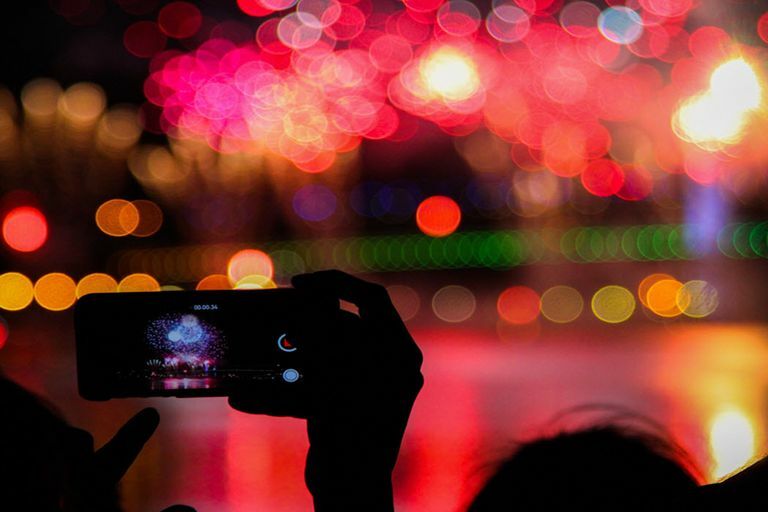 Because of the intensity of the light in a fireworks burst, it's best to use a low ISO setting that will limit the light striking the image sensor. Something between ISO 50 and ISO 200 usually is best, but you'll have to adjust the ISO setting manually. Be steady. Always use a tripod to shoot fireworks photos. Because of the slow shutter speeds required to capture fireworks, such shots are especially susceptible to camera shake, which leads to blurry photos. Even the image stabilization features built into many new cameras cannot overcome the problem from camera shake with a slow shutter speed. Only a tripod can hold the camera steady enough. Timing. When trying to time a fireworks burst for the best exposure, you might need some trial and error. However, it usually works best to open the shutter when you hear the shell launch into the air. Try to keep the shutter open for the entire burst. However, this can be tricky if several bursts are occurring simultaneously, which can interfere with the original burst that you're trying to capture. Try a few different techniques to determine what works best during a particular fireworks show. Fully open shutter. One trick you can use is to open the shutter fully (by setting the shutter speed to "bulb") and place a piece of black cardboard over the lens to block all external light. Then remove the cardboard when you want to expose the photo and return the cardboard when you want to stop the exposure. If you do this several times, you can capture multiple fireworks bursts in one frame. Once you have the number of bursts you want, close the shutter. Just be careful not to bump the camera when moving the piece of cardboard. Use a remote. If you have a remote or a cable release you can use to fire the shutter, it will greatly minimize the chances that you will bump the camera and ruin a shot by bumping the camera on the tripod. Hope for some luck. With fireworks photography, luck plays a role. With a large fireworks show, you never quite know what a particular burst will look like ahead of time, and it could appear anywhere in the sky. Try a variety of shutter speeds and exposure settings, to give yourself the best chance of capturing some high quality photos. How Do I Shoot Photos in Strong Wind?